We all love living, working and playing in Bothell. But did you know there are companies IN BOTHELL that are saving lives every day? That there is life saving technology being developed right here in Cougar Town? Its true! Here is an example of what one Bothell company is doing to save lives. Even in Europe! The technology is called Ekosonic System. It is a treatment for pulmonary embolisms. They system is just like a catheter that slides inside the arteries to treat clots in the arms and legs. It also has been used in deep vein thrombosis. Pulmonary embolisms are thought to kill about 300,000 people every year in the US and Europe. Europe must see the value of such device if it has agreed to let the device be marketed in the EU. How does it work you ask? It uses ultrasound waves within the catheter that move the clot around and assisting with breaking it up. 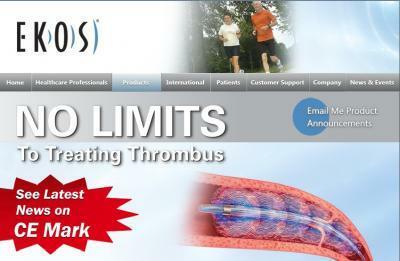 It is much faster than the standard clot-disoving drugs which are called thrombolytics. Using Ekos's new technoligy makes way for a more speedy recovery and is far less risky then standard treatments! It is real comforting to know that this kind of technology is saving lives all around the world and is being developed in our back yard. Way to go Ekos! Keep it up!